The Hancock-Clarke House is a historic American Revolutionary War site on Hancock Street in Lexington, Massachusetts. It played a prominent role in the Battle of Lexington and Concord as both John Hancock and Samuel Adams, leaders of the colonials, were staying in the house before the battle. The House is operated as a museum by the Lexington Historical Society. It is open weekends starting April 16 and daily from May 30–October 30. An admission fee is charged. 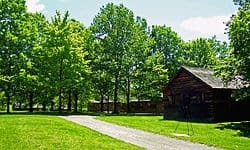 The Reverend John Hancock, grandfather of the American revolutionary leader of the same name, purchased this site in 1699. The house he originally built on the site does not survive. The current house was built in 1738. Rev. Hancock’s son, Thomas, a wealthy Boston merchant, is said to have financed the construction. The front or main portion of the house consists of the 2½-story structure with central chimney, a short center hall, two rooms on each of the two floors, and an attic. The small rear ell, 1½ stories high with gambrel roof contains a kitchen and tiny study downstairs and two low-studded chambers upstairs. As confirmed by tree-ring dating (dendrochronology), both portions of the house were built from trees felled in the same year. Succeeding Hancock as minister in 1752, the Reverend Jonas Clarke, who reared 12 children in the parsonage, was an eloquent supporter of the colonial cause. 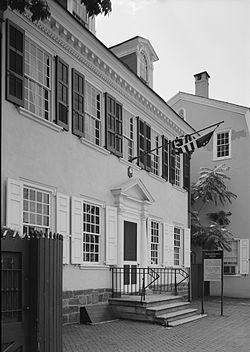 This house is the only surviving residence associated with John Hancock, famous American patriot, President of the Continental Congress, first signer of the United States Declaration of Independence, and the first Governor of the Commonwealth of Massachusetts. 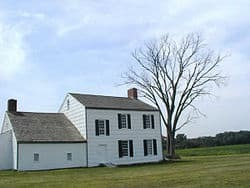 It became his boyhood home in 1744 when, upon the death of his father at Quincy, the 7-year-old boy came to live at this house with his grandfather. In 1750 John joined his childless uncle, Thomas Hancock, a wealthy Boston merchant who adopted him. 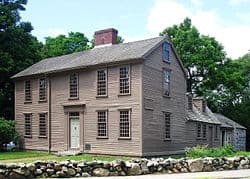 On the evening of April 18, 1775, John Hancock and Samuel Adams, having attended the Massachusetts Provincial Congress in Concord and wary of returning to Boston, were guests of Rev. Clarke. Fearing that they might be captured by the British, Dr. Joseph Warren of Boston dispatched William Dawes and Paul Revere to Lexington with news of the advancing British troops. Arriving separately, they stopped to warn Hancock and Adams around midnight, then set off for Concord.